In 2015 we get The Avengers: Age of Ultron. This announcement came out right after the conclusion of the Age of Ultron mini-series written by Brian Michael Bendis. Now clearly this future movie cannot translate the story frame for frame as it is incorporated into the Marvel Cinematic Universe. It is possible that the only similarity between the comic and the movie is the name. But it is fun to dig into this print story and dream of possibilities for the future. The story opens with a brief prelude. Spider-Woman is captured by the Intelligencia super villain group who has gained possession of a seemingly dead Spaceknight. But the knight awakens which ushers in a new age of human history, the Age of Ultron. The story then jumps into the near future, a future where Ultron has conquered and shattered the earth. The number of human survivors is small. The world’s surviving heroes unite in the Savage Land to launch one last attack against their conqueror. But two heroes, Wolverine and Sue Storm, elect to go into the past and stop the Ultron Artificial Intelligence from ever being created. The duo’s time traveling allows us to look into alternate Marvel timelines. And the climax of the story has major consequences for the Marvel universe as our heroes have abused time one too many times. 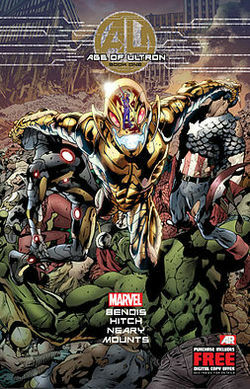 Along with the collecting the 10 issues of Age of Ultron, tie-in stories are included in this volume. These stories include tales from the Age of Ultron, such as Black Widow and Superior Spider-Man’s stories of survival. But other stories such as the Uncanny Avengers give us bigger glimpses into the alternate timelines, including a world where Scott Summer is an Avenger named Cable and his brother Havok is leading the Morlocks against the establishment. A final story delves into the past of Hank Pym and his desire to create Ultron, or to do something serious for once in his life. It becomes clear pretty quick that The Avengers: Age of Ultron cannot follow this story beat for beat. First of all Marvel has made it clear that Hank Pym is not going to be the creator of Ultron in the MCU. And Hank Pym’s first appearance n the MCU is slated for after the second Avengers film. So our heroes will not be going back in time to stop Hank Pym from creating his Artificial Intelligence. Additionally, Wolverine and Sue Storm have huge roles in this story. But they cannot appear in the MCU as currently 20th Century Fox has big screen rights to both characters. So if time travel is involved in this future Avengers film, it will probably include characters already introduced in the MCU. But if this is our basic blueprint I would like to see contrasting characters like Wolverine and Sue Storm make the time shift. It is really interesting contrasting Wolverine who will do what needs to be done and Sue Storm who’s moral compass abhors killing a good man but is conflicted by the fate of her children. Honestly, it was a really nice team-up. Another question is can Ultron carry a movie as a big bad. Even before this mini-series the answer was yes. Ultron’s comic history is deep enough that he can carry an entire movie as a big bad, probably better than a villain like Whiplash. Compared to many other villains, Ultron is simply overwhelming. In this story arc though we rarely get to see Ultron Prime. In effect what Ultron is as villain is an artificial intelligence who can infect or inhabit other digital devices. And really what we see throughout the story is Ultron avatars. We see robots controlled and modeled after Ultron, but they are in fact extensions of him and not his Prime intelligence (which honestly I do not know if you can narrow down since he is spread throughout all this different avatars). Okay, that really is a scary thought, and does put weight to an enemy you really cannot destroy since he is spread out amongst numerous locations. Really, how do you beat him? Time travel is really not something we have seen in the MCU. And I think that time sci-fi trope would be a great addition to the universe. Honestly, what I would really like to see is the alternate time line Avengers. One of my favorite images is of Steve Rodgers in his Captain American uniform, but wearing a Nick Fury patch. And it would be really awesome to see Scott Summers as Cable (which cannot happen due to contracts) and Alex Summers as the mutant leader. There are really interesting ideas that could be tried out in the MCU if we could glimpse at an alternative timeline or two. Maybe in an alternative future Winter Soldier may have served the role of Captain America, or Pepper Potts was Rescue instead of Rhodey taking on War Machine? Yes, there are really interesting concepts that this story could trigger in the writers and producers for the MCU. I really enjoyed Age of Ultron. I do not believe that the story’s impact will be deep into the MCU due to contracts and the look and feel of the MCU. But there are some really interesting concepts like the alternate timelines that I would like seeing played out on the big screen. But then I am a guy who likes weird stuff, and Age of Ultron presents images that do not fit into the Marvel 616 canon and they really caught my attention. Honestly, I wish I had invested my time in Age of Ultron on a monthly basis instead of Infinity. But then, reading it all at once may have really helped this story shine in my eyes.